The cosmic patterns and universal truths of sacred geometry bridge past and future. 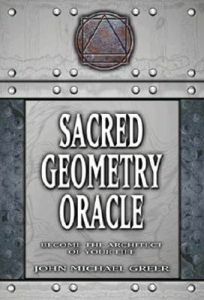 Now you can put this ancient wisdom to work in your own life with the SACRED GEOMETRY ORACLE. 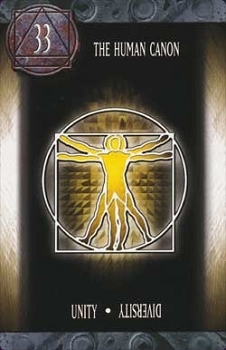 This kit contains 33 cards, each representing a basic figure in traditional sacred geometry, and each relating to one of the basic patterns of the universe - patterns that form the hidden structure of our everyday lives. Use the cards for divination, meditation, and self-exploration. This boxed kit contains a 33-card deck (3 3/8" x 5 1/8") and a 233 page illustrated guidebook to tarot divination. - John Michael Greer has been a student of occult traditions and the unexplained for more than thirty years. A Freemason, a student of geomancy and sacred geometry, and a widely read blogger, he is also the author of numerous books, including Monsters, The New Encyclopedia of the Occult and Secrets of the Lost Symbol, and currently serves as the Grand Archdruid of the Ancient Order of Druids in America (AODA), a contemporary school of Druid nature spirituality. Greer has contributed articles to Renaissance Magazine, Golden Dawn Journal, Mezlim, New Moon Rising, Gnosis, and Alexandria. 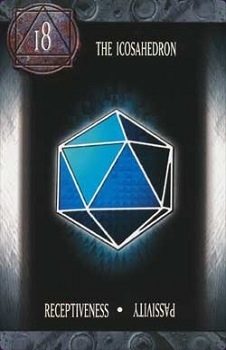 I love this deck! Besides being beautifully packaged with cards that are nice to touch and a very useful manual, it is "brain-correct". Each card has a contrasting pair (e.g., Isolation ~ Integration) which the manual suggests using for reversed vs upright card pulls. But the brain automatically refers to complementary opposites when it thinks. Our brain can't think of what Empty means without having a contrasting Full, for example. And beyond that -- new answers come from seeking an integration of the "opposites" -- like yin~yang make a whole Dao or particle~wave make light transmission more completely understood. So this deck allows the opportunity to reflect on and consider the complements in our own lives. If I draw Isolation~Integration, I can be reflecting on ways in which the issue reflects isolation, integration, and all the between states. By doing this, the brain can "drop into" a whole new solution/perspective on the issue that can seem magical, but is grounded in brain dynamics. A one of a kind deck!